Whoever thought making pita bread could be so simple and quick? This is a great and easy recipe that you can quickly throw together for sandwiches or even better pita chips! You must be careful to spread the batter as evenly as possible as you want it to bake evenly. Give it a shot, it’s worth the effort. When was the last time you had a pita pocket or falafel? By the way, this recipe is also yeast free. Great for anyone who also suffers from Candida overgrowth or are intolerant to yeast. It is pictured above with my Quick Chicken Salad. *I like to double or even triple the recipe to stock up the freezer! 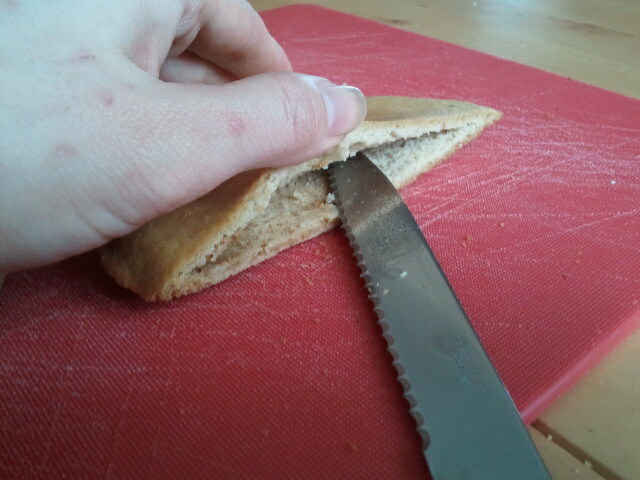 Let cool, cut in half, then with a small serrated knife, slice carefully down the center, creating the “pocket”. I’m so glad you found me as well! Mixing the two flours really makes a difference. I hope more of my recipes are good enough for your teens to eat as well! Keep coming back :) I am posting cake recipes for the next few weeks. this is a dream!! im running to the kitchen and making these now!! man, ive missed pita pockets!! These turned out perfectly! Simple recipe, easy steps and perfectly delicious :-) We had breakfast for dinner and stuffed these pita pockets with egg, turkey bacon and Daiya cheese. My 4yo and 2yo ate them up and asked for more :-) This is the first time I have been able to get my 4yo to eat a “sandwich” type properly, so I was thrilled!! I think I will make them in different shapes and also use them as sandwich bread next week. Maybe even get crazy and add some herbs, etc. :-) Thanks Michelle!! I missed these earlier. I need to go get me some Almond Flour! Then watch out…I have some serious baking to do. This would be so good with chicken salad…..drool. Michelle, I just made the pitas and I have three words for them A MAZ ING!!! Oh, my goodness, so easy and so good! Please keep the almond and coconut flour combo recipes coming! Thank you so much!! OMG! I am new to gluten free eating. While I am not celiac, I just don’t like the way I feel eating gluten products or bread. So I am converting over slowly. Yesterday I had some whole wheat pita and had a terrible stomachache this morning, an increase in weight and my tummy looked like I was pregnant. So I went on a search for gluten free pita bread today and came across your recipe and read the reviews. I ran out to buy the coconut and almond flour and made this immediately. AMAZING! Even better then regular pita bread! I couldn’t stop at just a taste and ruined my appetite for my delicious salmon dinner I am making. Can’t wait to try other recipes of yours. I found a few that I am going to make real soon as I have all the ingredients already. :-) THANK YOU!!! I am also new to gluten free cooking as I have recemtly found out that I am allergic to gluten in wheat/oat flour. I have been using off the shelf packaged GF products – pastas and mixes, but would like to put together ingredients to make the things I am used to such as rotis, fried bakes, pita bread, dumplings, dim sim, and my own pasta with herbs and spices. Your recipe for the pita bread sounds great. However is there another flour that I can use instead of coconut flour (cassava flour or more rice flour? Although the coconut itself is abundant in the Caribbean, it is mostly available fresh, grated and in desserts, not as flour). Also, what can I use to replace the eggs (to keep the cholesterol content down, especially if I want to make a couple dozen to freeze) ? I found a Gluten Substitute by OrgraN and an egg replacer powder – do you think I can use these in the recipe? Can corn starch or ground flax seed be used as a binding agent? I am anxious to get started because I am getting sick too often from foods with gluten and the GF products are soooo expensive in the supermarkets it is unbelievable. My thanks for any assistance you can provide. Wow! I was searching for something else and happened upon this recipe. It is something I truly need, too! I am reviewing one of our products we use in our gluten-free gift baskets, Orgran Falafel Mix and wanted to try to find a gluten-free pita pocket for others to try. I want to make them now, but am allergic to coconut. Perhaps I’ll try another flour as a substitution. Thanks so much for sharing! This recipe sounds so good! My husband & I have been GF for only a year and are learning how to substitute foods each day. Is it possible to double or triple this recipe so I can freeze several batches. Thanks for sharing your recipes! Adjusting to gluten free is definitely a learning experience! I have doubled the recipe very easily. Hope you enjoy them! I just made these pitas, and I enjoyed every last crumb of my first peanut butter and honey sandwich since going grain-free! I used Trader Joe’s almond meal, and the texture was perfect. What’s your experience with storing these? I’d love to make a double or triple batch to have for sandwiches throughout the week, but I don’t have much experience in storing baked goods made with almond and coconut flours. Thanks for the storage tip! I’m so excited to have a stash of grain-free pita/sandwich bread/taco shells in the freezer! What is the best way to thaw the frozen pitas? I could not wait to try these. My husband LOVES Greek Gyros but we never eat them because most restaurants have ingredients that I cannot have, namely MSG or other Glutamate forming things. Tonight however, I made all natural Greek Gyros complete with your Gluten Free Pita Bread!! I even had the Tzaziki sauce too, all homemade! My family was so excited. My pita batter was thick like dough so I added a little more water. When they baked they came out really nice but they look like huge chocolate chip or peanut butter cookies instead of having that nice flat smooth surface that yours had in the picture. It did NOT affect the taste at all. I so enjoyed eating the whole thing. I was in heaven, but when you say in your instructions to POUR the batter into 4-6 inch rounds should it literally POUR? Or, should I spoon it and try to spread it with my spoon?? If I had to guess I would say I probably did not have enough liquid. Maybe the coconut Tablespoon that I used had a little more on it that it should have? (sheepish grin) None the less, I LOVE this recipe. I totally cannot wait to eat one tomorrow with PB&J like your last poster said. Hurray for GF Pitas!! Yes you need to spread the batter, because it is kind of thick. I used a small offset spatula, but I’m sure the back of a spoon would do the job just fine :) Greek Gyros sound super yummy right now… I’m gettin hungry! Can I substitute any nut flour for the almond flour? I must the the recipe sounds wonderful but I’m wondering, have you tried this with different brands of coconut flour? I ask because I have had some very bad luck using coconut flour following recipes that others have made successfully, notably cookies. The posters cookies turned out beautifully while mine ended up as one huge mess on the cookie sheet floating in a bed of oil. When we compared the nutritional stats on our different brands of coconut flour, we found some major differences. What brand of coconut flour do you use? Or perhaps combining with ground almonds makes the difference? Thanks for your thoughts on this. I have used both Aloha Nu and Tropical Traditions coconut flour. They both work well in my recipe. Just be sure to pack the coconut flour down, as if it were brown sugar, when you are measuring. That is how I measure it in all of my recipes. Good luck! I just tried this recipe tonight with a triple batch of baba ganoush, and everybody loved it! I found the ‘packing’ instructions rather odd- I prefer to measure flours by weight for consistency- but it all worked out. I doubled the recipe and made 9 small pitas- easier for the kids. Much easier than the almond flour crackers I was considering, which require rolling pin work. Thank you for sharing!! I know my method for measuring the flours is different than most, but have found it works for most people to follow. Making mini pitas is a great idea. I’m glad they worked out for you! These pitas are fantastic! I just tried the recipe, and now I am holding a ham-stuffed pita pocket. I thought pitas were gone from my life, so I’m happy to welcome them back. My batter was really thin, and I was nervous about that, but it seemed to work just fine. I’m so glad that you are eating a ham-stuffed pita again :) I love stuffing mine with chicken salad! Or using it as a taco shell. Hi Michelle, I hope you don’t mind but I shared this link on the Wheat Belly Facebook page. I have been loving your recipes and thought that audience would as well. I particularly love that you don’t use gums or other things like that. I don’t mind at all! Thanks for sharing my page! I have been really enjoying your blog and recipes for the past 6 weeks since my naturpath recommended I become g-free. We’ve finally determined that I have candida overgrowth and I was so excited to find this recipe that works for me! I’m on a pretty restrictive diet for now and with the holidays coming up (and baking all my kiddos traditional faves), I am REALLY craving some kind of treat and am only allowed to use stevia. Have you ever experimented successfully with stevia? I’ve found some recipes online but I love yours the most because your style of baking resonates with me – wonderful without being too complicated – like “Mom’s” cooking! 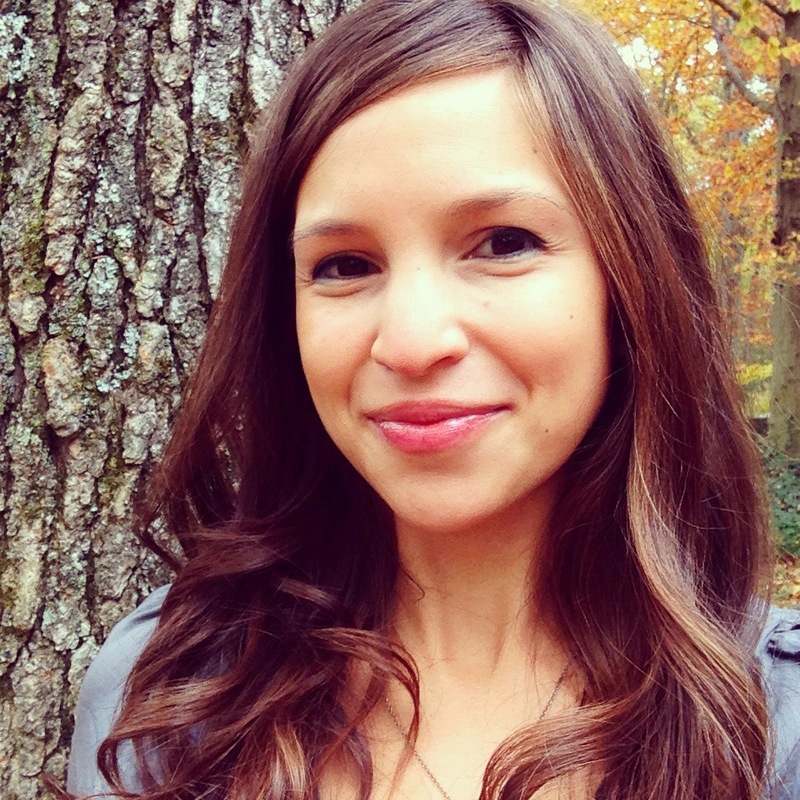 I’ve thanked you before but want to thank you again for sharing your story and your hard work! BTW, we have been enjoying unwrapping a Christmas book every night thanks to your idea. Have a very Merry Christmas! I can’t wait to try this recipe!!! I’ll be making them tonight for dinner, wish me luck! I would love to try this, but I can’t get coconut flour. Could I sub more almond meal or maybe other type of flour (for example, oat flour)? I haven’t tried it with all almond flour, but I think it could still work. Let me know if you try! Almond and coconut flours are super easy to make yourself using a coffee grinder! You can make others too. You make small amounts, and this recipe doesn’t call for much anyway. I can’t wait to try this recipe! Very true. I’ve never made coconut flour (I use Tropical Traditions brand, and lots of it), but I make my own almond flour. I grind them in my food processor, then put the meal in a coffee grinder to make it fine, more like flour. It works great. I do it this way because I soak and dehydrate my nuts first for better digestibility. I think it’s cheaper too, as I buy nuts in bulk. Can you substitute the flours, like all purpose gluten free flour? Gave the pita bread recipe a whorl, even though i have every gf flour known to man with the exception of coconut flour. Too impatient to wait, i used millet flour instead. Perhaps that’s why I had soup? So, I added some soy flour… then some millet flour… Could be the altitude/humidity as well since I live on the Eastern High Plains of New Mexico? No worries, it worked like a charm. Not being able to leave well enough alone, I had to make a 2nd batch with parmesean cheese, italian herbs & garlic…. I’m in heaven – thanks so much for posting these wonderful recipes, Michelle! Do you think it will work with almond meal instead of almond flour? I try to make gluten free pita bread. I followed the intruction but it still didn’t turn out right. Instead it stick to the cooking sheet. When we mix the ingredient together is it suppose to be liquidly. I wonder could it be because I used extra large eggs and olive oil is that why it didn’t turn out correctly? The consistency is somewhat thin, I always use large eggs when testing my recipes for consistency purposes, so that would make a slight difference. Did you pack the flours firmly when measuring? And may I suggest cooking it on greased parchment or a silpat to help with the sticking situation. Let me know if these suggestions help! Hey, Michelle. Just wanted to stop in and say thank you for this wonderful recipe!! I’ve been making it for awhile and it is so easy and versatile. One thing I have done instead of making them into flat pita bread is to pour half the batter into a little 4″ cake pan and bake them. They turn out thicker and more like sandwich bread, though small. It was a great thickness to hold a small grilled burger. Just thought I’d throw that out there in case someone else hadn’t thought of it. I love the bread both ways and try to keep both in my freezer at all times. hi. I just have a question is it 1/4 cup almond flour, firmly packed OR 1 1/4 cup almond flour? It is only 1/4 cup almond flour packed… this is a very small recipe and also the coconut flour helps thicken the batter. Let me know if you try the recipe! We made these on Saturday and they are SO good! First sandwich we have had since Feb. since starting on Wheat Belly lifestyle. Can’t wait until our tomatoes come in so we can have us some mator sandwiches with it. Thanx!!! Oh for the person that could not get coconut flour try Tropical Traditions. I keep mine in the freezer for freshness! It had a good flavor, but the texture was off to me and it was more of a flat bread…what did I do wrong? It was really mushy. Absolutley love your site! I am new to the gluten free world and was so used to making everything homemade that I don’t want to be sucked into the processed pre-packaged stuff. It is refreshing to find your recipes without the use of all the crazt ingredients like starches and other things. I look forward to experimenting more in my kitchen. Since we seem to have similar views….I was wondering what you did for bread? I have enjoyed the Udi’s brand but don’t like all of the extras in it. I want to make my own. Thanks again for helping me with my journey!!!! Absolutely brilliant! Sharing this all over the place. Such a treat for those of us on SCD. Thanks for sharing such a simple, yet wonderful recipe! The easier the better! We can’t wait to make these! They look yummy!!! 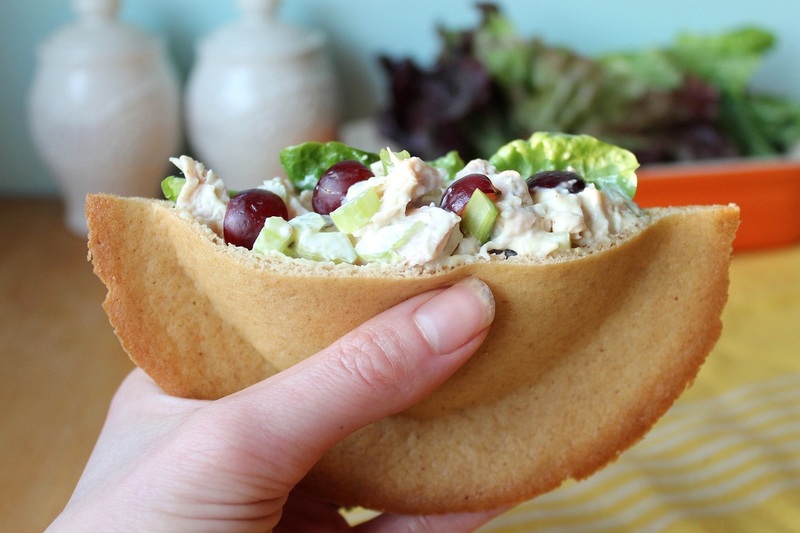 I would love the recipe for that great looking chicken salad that is pictured in the pita? Just put my first pita’s in the oven when my 19 year old son text me and asked if I would make some banana pancakes for him. He has been home from college for a couple days and he’s been loving your recipes. We’ve had both pancakes, chicken burgers, cinnamon raisin cookies, and chocolate peanut butter muffins. He is is gf heaven! Thank you for this site, my family has only been diagnosed for a few months. We have happy in our days again! I am so thrilled to hear that your son is enjoying my recipes and easily adjusting to the gluten free lifestyle. I know personally that it can be tough! Thank you so much for your kind words. Wow! Thanks for the recipe! I love it! I was able to eat pita chips and homemade hummus for the first time ever! I love this recipe and your website. By the way, congrats on the bun in the oven! Great recipe! I needed to tweet it because the first time it didn’t work (tried baking them on a pizza stone). Second time, I doubled the recipe and used a bit more baking soda 1/2t and used parchment paper to line 2 “Marie Calendar Pie Tins”. This was great because it had the exact form and thickness. Also needed to bake it at a higher degree ….360 for 20 minutes. Simply fabulous! Thank you for the great recipe! I’m vegan and gluten free (most of the time), so I had to modify / substitute some. Even so, the end result was awesome! I subbed the egg with Ener-G egg replacer for 1 egg. Didn’t have any coconut flour, so I used gluten free all purpose. Took about 4 TBS before it got to be thick. Didn’t have almond flour, though I did have almond meal. Used the same amount as the almond flour. Used olive oil and everything else was the same. Baked them for about 20 min on a parchment lined sheet. After cooling in the pan for a couple of min., I put them on a baking rack to cool. Then cut them in half and slowly opened them up with a nice serrated knife. I put in some veganaise, baby spinach, baby bella shrooms, a dash of garlic powder and salt and yummmmy! Can’t wait to try it your way! Thanks again for very easy to make recipe! Much rather use a whisk than a Ninja. Thanks for this info – I’m vegan, too, so was wondering if egg substitute would work. Is that an Oxo bent icing knife you are using? Seems essential for this recipe as mine came out all bumpy, not smooth like yours. Also, how did you get such neat circumferences? Any tricks for that? Hello! I’ve been looking around for gluten free pitas in the store and have had no luck. I stumbled upon this recipe and have decided to try it out :) Can you substitute egg whites for the whole egg?? Did any one have problems with them being too crumbly? The texture of mine was almost like a cornbread or something. Certainly wouldn’t be strong enough to hole anything in them. Tips? I responded to your problem, its below yours. I had some similar complaints. Then I solved them. The last entry are tips for those of us who like yourself had this experience. I hope you check it out, try it and let me know if they helped you like they did me. I solved it and some other issues as well. I got your recipe from someone else’s website, he credited your website for it. So I came here to find some solutions. Jessica Martin’s problem is the same as mine. He said to pack the coconut firm (1 Tbs) and I did, and pack the almond firm (I did). I followed everything. Mine was thickened by the coconut (yay!) but I ground my own almond flour. I sifted it too to make sure it was ground fine enough. Anyway, it browned quite a bit on the edges and was hard to remove even though they were on oiled cookie sheets. They were really thin even though they seemed thick when I poured them. So I cut them in half and cut the pockets and was please they made pockets, but they won’t hold food. They won’t even be used in quarters to dip in humus. They break. . In your recipe, once packed for measure and put in the bowl do you mix them before adding them to the oil mixture? Could it be Ii didn’t grind my almond flour enough, even though I sifted it too? I suspect the almond for some reason. I will keep trying them, because they are so tasty even if the texture isn’t strong. I did this twice and I’m not giving up yet. I hope you can give some suggestions. By the way, the guy who posted the recipe said the coconut flour absorbs the moisture and so its important to pack it so your sure to have enough. Why are we packing the almond flour? He has that on his copy but I don’t see it on yours. Maybe I have too much almond flour because I’m packing it too. Please help and much thanks. Well, don’t know if this will post. My last two were done April 20, 2013 and it still says my comment is awaiting moderation. Not sure what that means but . . .I SOLVED EVERYTHING!! Just remember, ovens vary so obviously since sooo many people were successful and I wasn’t it only means I needed to find out what my oven, my kitchen, humidity, ect and so forth was doing. I’m in Minnesota. So I tried different things and that included a slight increase in my oven temp (see last entry below). These are solutions just for me but if you try them and they work for you, fantastic! Rough bumpy texture: I made sure I sifted the almond flour and then when it was still grainy bumpy like, when I mixed wet with dry I used an electric mixer. Then let it sit for a couple of minutes and let the coconut absorb the liquids. 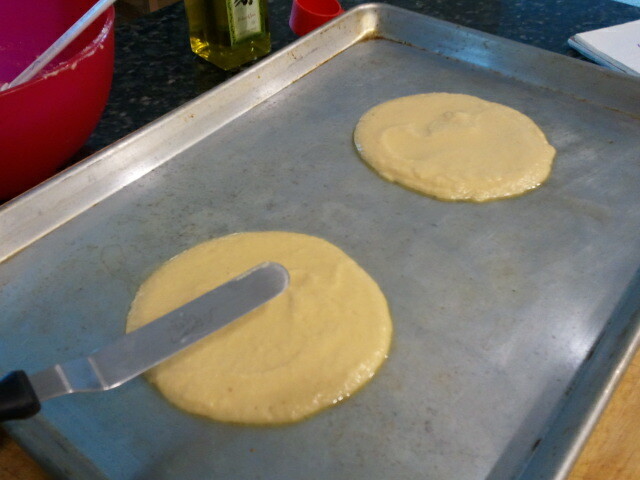 The batter was thicker and smoother. Binding issue: (crumbly). I needed a large egg for sure! My lovely organic free range eggs were too small. But what to do. I didn’t want to buy large eggs that weren’t free range for this one project. So I doubled the batch and used three small eggs instead of two. It worked! Egg is an perfect binder. Lack of strength (breaks when using it as a dipping pita for humas. Goes with crumbly). The egg helped with this but also, I increased slightly the amount of salt & baking soda. I had already increased it for the 2 pita recipe. instead of 1/8 I did 1/8 +, (like 3/16) and the baking soda I used 1/4 tsp. It thicken the walls of the pita and rose slightly more. And today when I did a double batch I increased the soda and salt according to what I did with the 2 pita recipe. So in this case (my case) it made the pocket thicker as before and the larger batch made the pouring slightly thicker too, thanks to the extra egg. I poured the batter and instead of making 4 pitas of size 5, I made 3 large ones that were almost 7″ each. Made these today – another fab recipe Michelle!! Mine turned out perfect! Amazing texture! I think if you even cooked these square it would make great toast! Put syrup on and pancakes even! Can’t wait to try more of your recipes! Thought I would also add – I made these and overcooked them to have with hummus when what I really wanted was chips and dip!! Very good!!! Hello.! !i can not find almond flour can I make it on my own?kisses from Greece.!! Wonderful! Grain Free! I really look forward to trying this as I miss grains and I just can’t have any of them. :-) Thank you! I have missed pitas and these look amazing. I’ve only been gluten free for a few months and I have not tried any baking yet, but I will try these. I’m stopping at Whole Foods this week, I’ll look for the two flours. Most baking recipes I’ve found for GF foods seem too imposing, but with just a few ingredients I think I could make this. The picture looks just like a regular pita. Oh wow! If I didn’t know better, I’d say it wasn’t gluten-free! So yummy! Thank you sososooso much! How would these turn out using an egg substitute, since I’m egg intolerant along with being gluten-intolerant? I have a sensitivity to coconut. What would be a good substitute flour for the coconut flour? Maybe you can measure the amount of flours into oz or grams? Cause not every almond / coconut flour is the same ;) Thanks in advance! I know this is an older post, but I just had to say how much I love this recipe! I’m working on eating better, and this pita bread is SUCH a nice treat!